Those painful words were spoken by my client Sam (We will use the name Sam to protect the innocent) as we sat in the conference room of his office. He told me he did not think his assistant was going to work out. I was surprised by his statement because only a month earlier he told me he was happy with her. What had gone wrong? Why in just a few short weeks was he now ready to throw in the towel with Sally? They even have a history. Sally had worked with him side by side for years as they grew his practice. Unfortunately, I have heard similar stories many times before and I suspect it will not be the last. Sam had simply outgrown his assistant. What was once a fruitful working relationship, had turned sour. Whose fault was it? If you ask Sam, it was definitely Sally’s fault. However, if we were to ask Sally I am guessing she would answer with something like “Nothing has changed. It’s always been like this.” In the end, it doesn’t really matter who is at fault for the breakup. In my experience, casting blame has never improved this scenario or any other situation for that matter. For a small business owner, it can be very difficult to handle these circumstances. You can’t just pass it off to Human Resources and request them to intervene. You can’t just ask one of your directors to take care of it. At the end of the day, it would be you and your employee sitting across the table face-to-face when you fire them. Because you don’t look forward to that uncomfortable situation and may even dread it, you might find yourself in limbo not making the decision whether to proceed with letting your assistant go for way too long. That is a dangerous place to be in for you and your business. Having an excellent assistant is essential to your productivity. He or she should naturally align her work performance with your goals. She should also complement your strengths and weaknesses so you can maximize the time you spend in your “productive zone of genius”. The investment you have placed in your assistant is enormous. That is clear. You have invested your valuable time, money, and energy in them, making the idea of starting over with a new person seem like too much to handle. Instead of playing the blame game or continuing to agonize over the decision whether to keep or fire your assistant which will cost you time and money due to lost productivity, you need to come up with a resolution. You must be crystal-clear with your expectations, both before you even hire your assistant and throughout your working relationship. As your needs change and you grow both personally and professionally you will develop different expectations for your assistant. That is common. Unfortunately, business owners often forget to relay new expectations to their assistants. Your assistant is NOT a mind reader. You must be clear and detailed about what you want from them and articulate that information with real-time feedback on their progress. As the professional, you are always improving yourself and learning more about your industry and how to grow your business. A great way to ensure you do not outgrow your assistant is to invest in their continuous training as well. That investment increases your assistant’s ability to meet your ever growing needs. There are many resources available for assistant training. Office Dynamics is one of many companies that offer both online and live training specifically designed for assistants. Training programs exist for hard skills such as computer programs, as well as soft skills such as mastering exceptional self-leadership. If you identify that the source of the problem is personality-based, often times the issues you are having with your assistant are not fixable. By clearly communicating expectations however, you may be able to resolve your issues and I suggest choosing this route first so you can have a chance at not losing the investment you already put into your assistant. Do you want him to act more enthusiastic about your projects? Do you wish she would not come in a few minutes late and leave a minute early every day? Should he dress like he cares about his appearance? Should she sound happier when answering the phone? Whether your issues are skill-based or personality-based, it is important to voice your expectations which may effectively resolve your dissatisfaction with your assistant. If you exhaust your efforts and simply cannot improve your working relationship with your assistant, it is no longer beneficial to you or your business to keep them. Upon that conclusion, my advice is to terminate employment. This in itself is one of the most difficult decisions a business owner has to make. I often see my clients in limbo over this decision for months on end which is NOT good. Working in a state of uncertainty negatively affects your personal productivity as well as the office’s productivity. The longer you wait to strike the gavel for fear of the unknown, the more damage you do to your business. I have had countless clients experience this very situation over the years and no one regretted their judgement after it was finally passed. To fire or not to fire? That is the question and it’s a loaded one. Only you can make the decision whether or not to fire your assistant because you are the person who has to work side by side with them, day in and day out, witnessing all of their personality quirks and lack of abilities. If you do not see a vast improvement in your working relationship after clearly communicating your expectations and providing additional training, it’s time for a breakup. Find clarity on your decision and take action soon to greatly improve your situation. 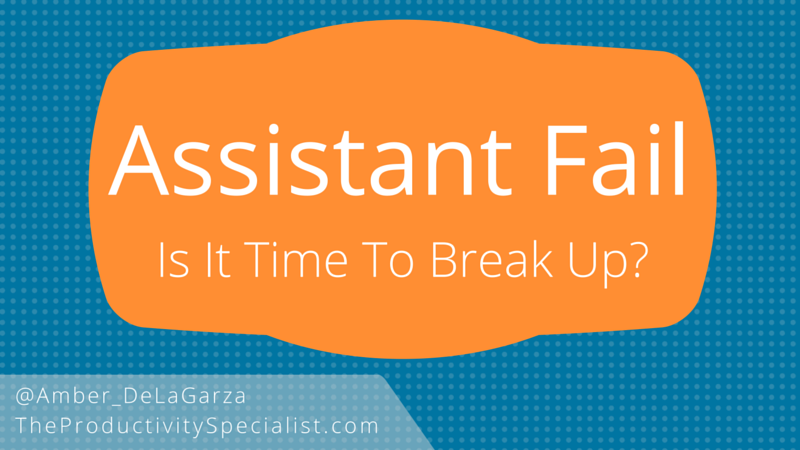 After all, your new assistant may just be your perfect match! Commit to clearly communicating your expectations to your assistant and providing feedback on their progress. Beautifully said! I don’t know a single business owner who hasn’t had this struggle. Thanks for bringing clarity to the subject!